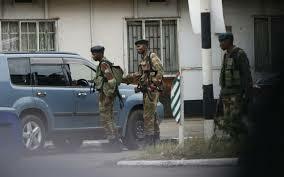 THE military has retained its presence at strategic State security institutions such as the Police Support Unit headquarters at Chikurubi in Harare, although soldiers were withdrawn from the streets and highways at the end of Operation Restore Legacy on Monday. Armoured vehicles were still stationed outside the Police Support Unit headquarters yesterday with several soldiers guarding the premises. Zimbabwe Defence Forces spokesperson Colonel Overson Mugwisi declined to comment over the issue, saying he was on leave. He referred all questions to army spokesperson, Lieutenant Colonel Alphios Makotore, whose mobile phone went unanswered.